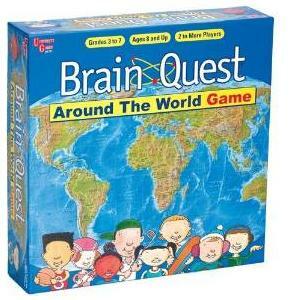 In Brain Quest Around the World, players answer geography questions. Board looks like the map of the world. Children learn geography facts and the geography of the world. Around the World by Brain Quest is a fun geography board game that teach kids geography and that can be enjoyed by both parents and children. The board looks like a large map of the world and there are over 600 questions included. Kids explore the world and answer questions about cities, countries and continents. What we like about this board is not only the fact that it is enjoyable and that it teaches geography but that the questions included range from easy to difficult. Therefore, kids do not get frustrated with questions that are either too easy or too difficult. There are easy questions that could be like "what is the capital of the United States?" or more difficult questions that are challenging even for adults. Therefore, both children and adults can play this game together, enjoy it and learn geography in the process! The map is also a great way for kids to learn to locate countries and continents and to get acquainted with world maps. The only drawback about this game is that it is not always easy to find online. It is also more expensive than other geography board games. But one has to consider the quality of the questions and the fact that Brain Quest Around the World is very educational. In the game, players race around the world by answering questions about cities, countries and continents. Players can use the map (which is the game board) for clues to answer many of their questions therefore they learn how to look at a map and become familiar with maps. In order to win the game, players have to answer correctly one question from each of the continents. By the way, Brain Quest has other geography board games including Brain Quest States which contains only questions about the United States. It also has other educational games such as the Brain Quest Travel Card Game where kids answer questions related to Math, Science, English, Arts, Social Studies and more.